I know, it’s cold outside. Really cold. Maybe you’re feeling under the weather or battling that nasty cold that’s been going around. In your desire for some warm, soothing comfort, you open your cabinet, pull out the can with that ubiquitous red and white label, and reach for your can opener. No one blames you – we’ve all been there. The starving artist is here to tell you that you don’t need to fall into this trap. You can have hearty, comforting, HOMEMADE chicken soup with that all-day slow-cooked rich flavor in less than 40 minutes. Seriously. How does the starving artist do it? Let Costco do all the slow-cooking for you by grabbing one of their $5 rotisserie chickens. That cheap little chicken is all the depth and flavor you need to make a killer soup. With just a few additional ingredients – veggies, noodles, and stock – you’re going to have the best soup you’ve ever had in practically no time at all. Watch the video and see how it’s done! This soup will last in your fridge for 5 days and also freezes very well if you happen to make too much. I really REALLY want you to try this recipe. Homemade soup is perhaps the starving artist’s greatest weapon. It is filling, it is healthy, and there is no other food that will give you bigger bang for your buck without sacrificing quality. Try it once and you’ll never waste your money on canned soup again. Hooray! 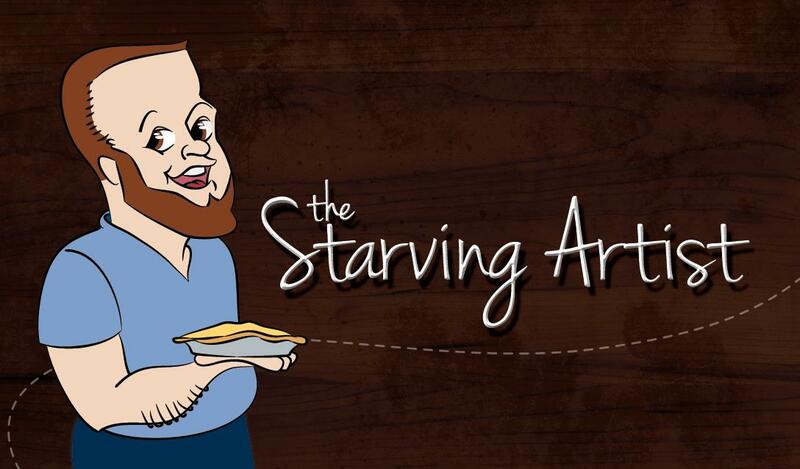 Friends, I’m pleased to announce that tomorrow I’ll be posting a new episode of the Starving Artist! Looking for a cheap and easy dish that will warm your body in soul in those frigid single digit temperatures? Tomorrow I’ll show you how to take a $5 rotisserie chicken from Costco and turn it into a big steaming pot of homemade chicken soup that tastes better than your grandma’s and can be ready in less than 40 minutes. It’s the perfect comfort food to melt away all that cold and ice and make you feel all warm and gooey inside. Tune in tomorrow! And don’t forget, you can all episodes of the show by clicking on the video tab at the top of the page or, better yet, by visiting my YouTube channel and becoming a subscriber. Hooray! This weekend I helped host a baby shower for my dear friend Clint and his wife Marisa, who is due at the end of February. The idea, thought up by our friend Heather, was to have a party focused on the father, sort of a bachelor party for a dad-to-be. Combining cutesy baby crap with men and beer… literally. Because we’re all starving artists, we couldn’t really swing a swanky bar or restaurant to host, so instead we used the game room in my building – free and cozy. Done. Heather took care of the invites and the decorations. She cleverly hung all sorts of male-oriented onesies (superheroes and such) and instructed all the guests to bring a six pack of beer and diapers. And because their baby is in fact a boy, he got to take home all of them to be used in the not-too-distant future. So resourceful. As you might have guessed, my job was to provide food. To me, nothing says man party like chicken wings. I’m not gonna lie, I make some pretty damn good wings. 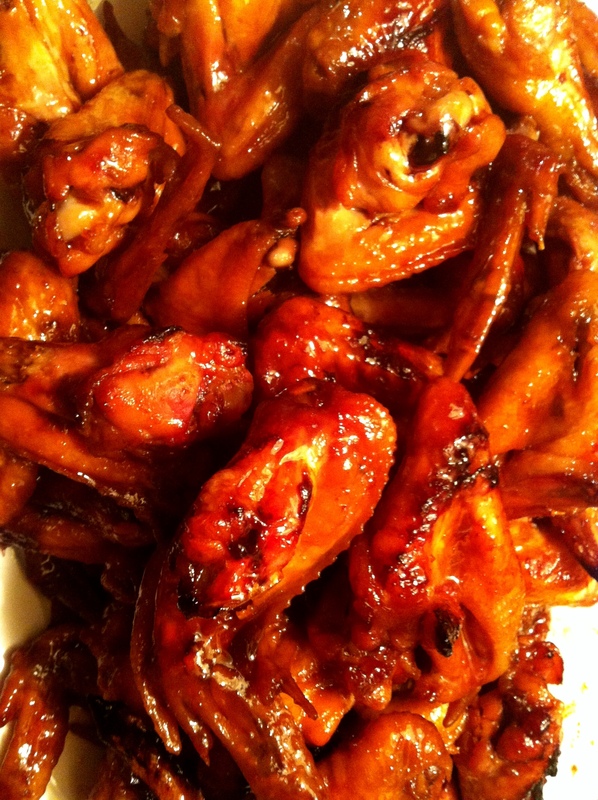 Well, I should say my mom makes pretty damn good wings – I’ve just been making them for friends and parties for years. I use fresh chicken wings you find next to the breasts and thighs and such in the refrigerator section of your grocery story. Truth be told they are not cheap, particularly considering how many you have to make to feed a crowd. BUT this time of year with football season in full swing, they had huge family packs for 50% off. I was able to leave the grocery store with about 40 wings for less than $15. That is a steal. And remember these aren’t party wings or drummettes, these are full-on chicken wings, labeled “wings” on the package. To make, preheat your oven to 425 degrees. One batch of sauce consists of: 1 cup of soy sauce, 1 cup of white sugar, and 1.5 cups of dark brown sugar. You need one batch of sauce per dozen wings. I had three dozen, so I tripled the recipe. I combined everything in a large sauce pan, mixed well, and put it over medium high heat, stirring frequently until it JUST comes to a boil. Be careful as the sauce boils over REALLY fast. While this was cooking I arranged my wings in three disposable aluminum pans. You definitely need disposable since this sauce is way sticky – you do not want to have to clean it off your pans. I put about a dozen wings in each pan – you want to make sure they fit in an even layer, so you may wind up with a few less or a few more depending on the size of your pan. Once the sauce came to a boil I killed the heat and poured it over all the wings, using tongs to make sure every wing was coated. There should be a good pool of sauce at the bottom of each pan. Place them in the bottom half of your oven and bake for 1 hour. After an hour they will be brown, bubbly, and fall apart tender. It doesn’t get any better. I usually plan for two wings per person, but use your best judgement for your own party. In addition to the wings, I made Sherri’s potato wedges, which you might remember from an earlier post. They went SUPER fast. Both items were smash hits and made for perfect snacking at an early afternoon party. Yum. I’ll have all of you know that because I’m doing bootcamp, I didn’t eat a SINGLE one. Bootcamp update tomorrow! TIP: try making these hot by adding a squirt of Sriracha in the sauce – mmmmm!!!! Happy Sunday!! Last night I was struck with the inspiration to make a hearty dish involving beans and meat. I really have no idea why. Maybe it’s because I’m so desperate for fall that I decided I needed to make a dish suitable for cool fall weather. Or maybe I just really wanted something cajun… who knows… What I did know is that I wanted something thick and hearty involving sausage, beans, and rice. I have to tell you I really went back and forth on what to call this. Originally I was going to call it a “cajun stew”, but it really isn’t a stew – much too thick. 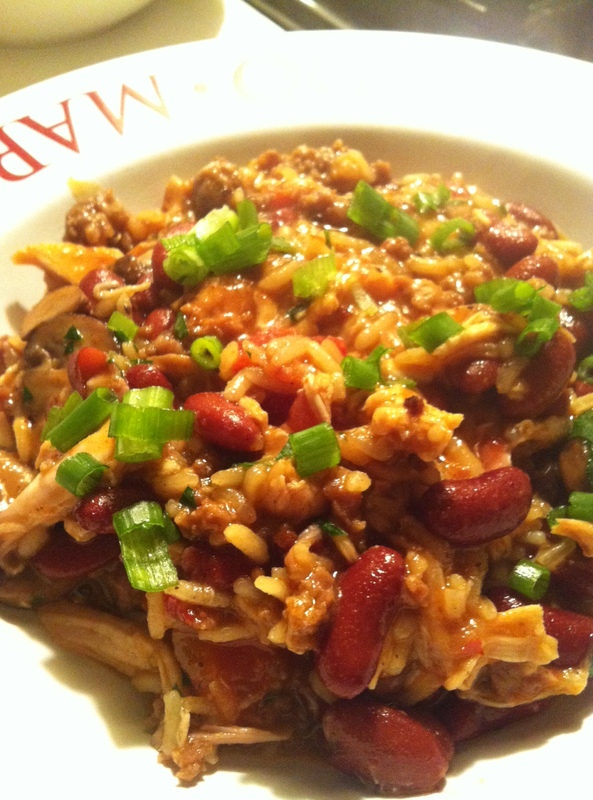 And technically it’s not really jambalaya because it doesn’t have seafood…. but then I remembered that I’m the starving artist and I really don’t care. The real joy of cooking is creating things we love to eat, so why not make things exactly how we want them. While I love seafood, it doesn’t really fit into my starving artist budget. Kidney beans, however, do. As does a rotisserie chicken from Costco. Voila. Starving artist jambalaya. Fair warning, there are a lot of spices in this recipe. Do not be intimidated. I know spices can be a little pricey, but I have to tell you, they are a fantastic investment: buy them once and they will be flavoring your dishes for months. But hey, if you don’t want to invest right now, leave them out. Even if you had just the cajun seasoning, you’ll still have a tasty and fantastic dish. Well, friends, I’ve decided to make up for my week absence with a down home recipe directly from my mom’s (Terri!) kitchen. This is a real winner – simple and addicting. You’re in for a treat. For some reason, despite the heat and my being so busy, I got an insatiable appetite for this dish this past week. I haven’t made it in years. It’s one of those recipes that takes me back to childhood. Being the starving artist I’m always fiddling with recipes to enhance them, so I make it a bit different than my mom did. Namely, I use chicken thighs instead of breast – less money and more flavor. I season my chicken with poultry seasoning to add depth of flavor. Also, mom would saute her broccoli in the pan she cooked the chicken in. 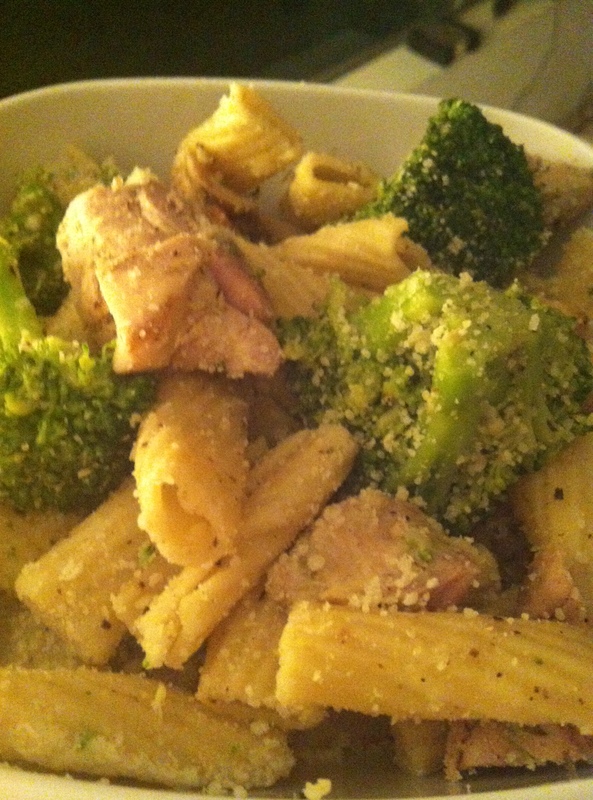 I like the idea, but the broccoli would never get quite as cooked as I wanted it to. So I just throw it in with the pasta for the last few minutes of cooking to get it nice and blanched, then toss everything together at the end. Really I’m just streamlining the whole process while retaining all the flavor and simplicity.